Progressive Power Metal bands generally fall into the same trap as that of regular Power Metal bands and sound like a mixture of several bands from a list that we all know only too well, that dreamy theatrical style especially noticeable. 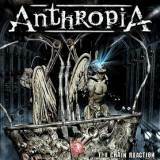 Still, if you enjoy your Metal then it’s likely that this little genre has its own rewards, and French Prog-Power horde Anthropia present an enjoyable second album here with The Chain Reaction. There’s a real mixture of styles, from Gothic Metal balladry to crunchy Thrashings, and the music’s played with passion and skill; admittedly not always with the catchiest of intentions, but it’s complex enough to be listenable whilst you figure that out, and the songwriting is more than acceptable overall. If this sounds like I’m damning Anthropia with faint praise, then you’d be wrong, as there are plenty of moments that prove The Chain Reaction to be worthy of your time. One orchestral intro later, the first track proper A New Self kicks in, initially riff-driven and with male and female vocals duelling before shooting off into melodic instrumental territory, male vocalist Hugo taking the lead. He’s not the best you’ve ever heard, but he gets the job done and the guitars are more than good enough to make up for any doubts. Whipping Soul continues in a slightly more epic direction, building up wonderfully towards a modern Dream Theater-esque ripper, complete with piano interlude a la Muse. Despite nearly being eight minutes long it flies by, and even a hammy spoken word bit at the end can’t spoil it. The clumsily-titled The Torn-Off Wing Of The Butterfly is a step down, a slower, piece that is pleasant but meanders rather, and will likely be a victim of the skip button when push comes to shove. Fortunately, it’s back to the riffs with the proggy Take Me Home, driven by female vocals and a repeated maddeningly infectious riff, powerfully backed by the rest of the band. It’s Anthropia at their best, an instrumental section elevating the song with style and hints of funkiness hinting at a future, more original path for the band. For the moment, few will be disappointed with touches of Italian grandeur such as interlude The Night At The Opera or the modern crunch of The Altar Of Trust, a rather awesome song that twists and turns between tech-riffing and Power Metal histrionics, a mini drum-solo partway through adding colour and Nathalie’s female vocals at their best. Anthropia put two epic-length tracks next to each other, the eight-minute Trinity (The New Consensus) and the nine-minute The Tree Of Life, and it’s a credit to the band that both are excellent, the former kicking off like a recent Lacuna Coil track with bouncy riffing and uplifting female vocals before switching to complex overlaying melodies in the best Prog Metal fashion. Of course, there are plenty of twists and turns, but half the fun of these sort of bands is discovering them for yourself, so I’ll content myself with saying that it’s well worth the time invested, and the following The Tree Of Life takes a more melodic, symphonic turn that is equally as good. The Chain Reaction won’t be the best album of this genre that you’ve heard in a while; there’s nothing here that others haven’t done before. Yet it’s an enjoyable listen, an album that really grows on you, and is more than enough to make sure that future efforts from the band will be awaited hungrily. Recommended for fans of the style.